The enviro-wackos are determined to stop our use of carbon fuels—coal, oil and gas. Forty years ago, they had a different target. Then, they were protesting nuclear power plants. And, for the most part, they won. There hasn’t been a new nuke plant built in decades. DES MOINES – It’s been 33 years since Raye Fleming’s arrest outside Southern California’s Diablo Canyon nuclear plant, near the height of the furor against nuclear power. That was the first arrest of many, and Fleming thought such actions paid off as a generation of Americans turned against nuclear power. “It was just the correct, moral thing to do,” said Fleming, 66. But after years of believing they had won the fight against nuclear energy, activists feel the battle is starting all over again. And they’re trying to figure out how to win in an era of Facebook and Twitter and get the younger generation involved in the movement. Lately, the option for nuclear energy has gotten more popular. President Obama has backed billions of dollars in federal loan guarantees to build two nuclear reactors in Georgia. If approved, they would be the first nuclear power plants in the United States to begin construction in almost three decades. Political support for nuclear power has grown, especially after the oil spill in the Gulf of Mexico highlighted risks of fossil fuel production. And people are more open to nuclear energy. The environmentalists have blocked the construction of new refineries. Their NIMBY fellow travelers has triumphed in closing many of the existing refineries. At my last count there are only four major refineries in the country. One on the west coast, one on the east coast and two in the gulf. When the gulf refineries were damaged five years ago from Hurricane Katrina, gas prices sky-rocketed and gas-lines formed in many areas of the country. The enviro-wackos want us to move to electric vehicles. The truth of that is that our electrical power infrastructure cannot support the dramatic drain on electrical power needed to re-charge those vehicles. Not in the amount needed to relieve our dependence on carbon fuels. More nuke plants could relieve some of that congestion. When the anti-nuke movement was in full swing in the US, France was building more nuke power plants. Today, France receives 77% of their power requirements from nuclear power plants. The US, on the other hand, receives only 20% of our power from nuke plants. Size aside, Sweden, Korea and Switzerland produces a larger percentage of their power from nuclear plants than does the US. Some in the environmental movement are coming to understand that. Some, like Patrick Moore, have simply changed their minds. He was once a leader in the anti-nuclear movement, and now he’s co-chair of the Clean and Safe Energy Coalition, which supports the expansion of nuclear power. “I personally believe that because we were so focused at that time on the threat of all-out nuclear war and the emotional aspect of that, we were a bit blinded and included nuclear energy in with nuclear weapons as if everything nuclear was evil,” he said. “The bottom line is, I believe we made a mistake,” he added, noting that although construction costs for nuclear plants are high, operating costs are low. He also contends that nuclear energy is a safe and valuable resource. Nuclear-power protesters who were on the picket lines years ago know that to be effective now, they have to update their tactics. No more protests, sit-ins and horror stories rooted in the nuclear disasters at Chernobyl and Three Mile Island decades ago. “It’s 2010. It’s not 1979. It’s a different generation. There are different styles,” said Michael Mariotte, a longtime opponent of nuclear power who heads the Maryland-based Nuclear Information and Resource Service. “The whole idea of mass marches and that kind of thing doesn’t have the same kind of resonance as back then.” Mariotte’s group alerts members to big issues via Facebook, links to anti-nuclear stories through Twitter and posts videos on YouTube. — Washington Post, August 30, 2010. Perhaps it is time, once again, to use the nuclear option. “The Obama Administration thought it was a small thing; regulating fishing to the point of extinction of an industry, to appease their environmental supporters from Greenpeace, The World Wildlife Foundation, Defenders of Wildlife and the PEW Environmental Group among others. Who would have thought that the series of Executive Orders than implemented the report from Interagency Ocean Policy Task Force would trigger what is now known as the Second Revolutionary War. Yes, the introduction above is fictitious. Unfortunately, the report by the Interagency Ocean Policy Task Force may not be fictitious nor the resulting Executive Orders by Obama. The result of those orders could effectively ban recreational and commercial fishing in the United States. That means no more bass fishing, nor bass boats. No more Bass Pro Shops, rods nor tackle. No more fishing lures and bait treatment. No cottage industries that provides live bait to millions of anglers. It would result in the destruction of another American industry, a million jobs and a portion of American culture. I invite you to go to ESPN Outdoors Online and read the report yourself and then think what the impact would be. It’s a case, not of unintended consequences, but of intended consequences. 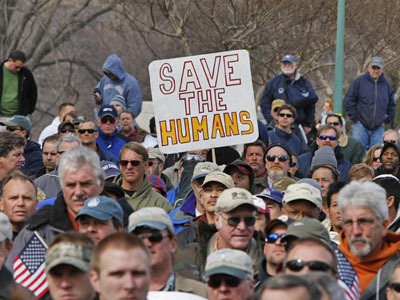 AP/Luis M. Alvarez One sign at the rally of recreational and commercial fishermen summed up the feelings. As ESPN previously reported, WWF, Greenpeace, Defenders of Wildlife, Pew Environment Group and others produced a document entitled “Transition Green” shortly after Obama was elected in 2008. What has happened since suggests that the task force has been in lockstep with that position paper. Then in late summer, just after he created the task force, these groups produced “Recommendations for the Adoption and Implementation of an Oceans, Coasts, and Great Lakes National Policy.” This document makes repeated references to “overfishing,” but doesn’t once reference recreational angling, its importance, and its benefits, both to participants and the resource. Additionally, some of these same organizations have revealed their anti-fishing bias by playing fast and loose with “facts,” in attempts to ban tackle containing lead in the United States and Canada. That same tunnel vision, in which recreational angling and commercial fishing are indiscriminately lumped together as harmful to the resource, has persisted with the task force, despite protests by the angling industry. As more evidence of collusion, the green groups began clamoring for an Executive Order to implement the task force’s recommendations even before the public comment period ended in February. Fishing advocates had no idea that this was coming. In the wake of the task force’s framework document, the Congressional Sportsmen’s Foundation (CSF) and its partners in the U.S. Recreational Fishing & Boating Coalition against voiced their concerns to the administration. “Some of the potential policy implications of this interim framework have the potential to be a real threat to recreational anglers who not only contribute billions of dollars to the economy and millions of dollars in tax revenues to support fisheries conservation, but who are also the backbone of the American fish and wildlife conservation ethic,” said CSF President Jeff Crane. Morlock, a member of the CSF board, added, “There are over one million jobs in America supported coast to coast by recreational fishing. The task force has not included any accountability requirements in their reports for evaluating or mitigating how the new policies they are drafting will impact the fishing industry or related economies. This is not the only access issue threatening the public’s right to fish, but it definitely is the most serious, according to Chris Horton, national conservation director for BASS. “With what’s being created, the same principles could apply inland as apply to the oceans,” he said. “Under the guise of ‘marine spatial planning’ entire watersheds could be shut down, even 2,000 miles up a river drainage from the ocean. “Every angler needs to be aware because if it’s not happening in your backyard today or tomorrow, it will be eventually. See this ESPN column from last Fall for an earlier report in the Task Force’s ending input from the public. If you treasure this American cultural past-time, get on the line to your Congressmen. Maybe, some democrats may listen even when they haven’t before. Democrat voters fish too.